Come springtime, Jeremy Jones refers to extended campouts and broad explorations as his “Super Bowl.” Yet this coliseum is far grander. It bursts thousands of feet high and holds abundant alpine bowls. There are no screaming fans, no beer commercials, no mustard-slathered meat tubes for sale out here. The face paint is sunscreen. The game is simply to go up and come down alive, and repeat until one’s legs, mind and body can take no more. It’s when the snow stabilizes, the light lingers and fair weather allows for big, foot-powered surveys of remote mountains. 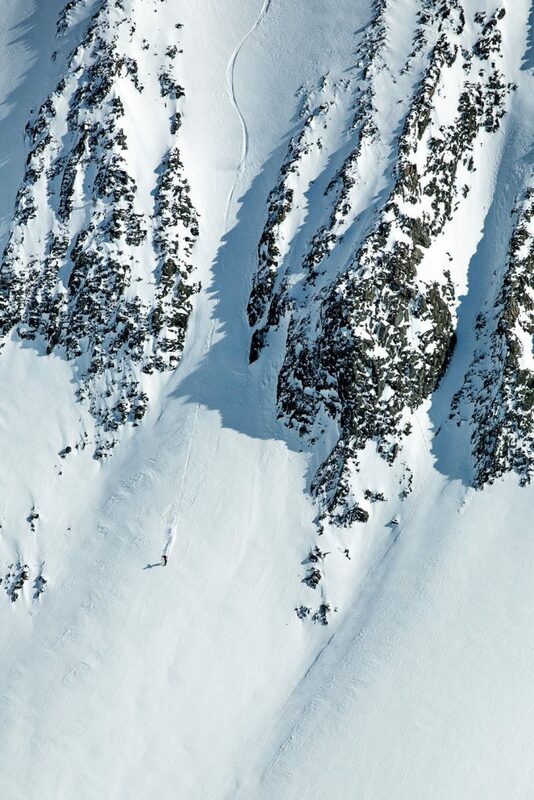 In April 2018, Jones, along with Robin Van Gyn and Mark Carter, embarked on a tour of Montana’s Crazy Mountains. The Crazies are a 600-square-mile range just northeast of Bozeman. An isolated mountain island in a sea of plains, the Crazies jut from the flatlands and top out at 11,214-foot Crazy Peak. The range is rugged and magnificent; its faces serrated with wide tracks of snow and jagged peaks. But getting into them isn’t easy. There are only a handful of public access points and trails. Some of the mountains and nearly all of the entryways are encircled by private property, leaving much of the range hardly explored, particularly in the winter. Philip Morris’ sprawling Marlboro Ranch and many other greedy folks are the gatekeepers to this vast cache of public lands. This is not a rare situation; there are many more controversial public enclaves throughout the west. The Rocky Mountain West has nearly four million acres of hardly accessible public lands, two million of which are in Montana. above Drying out by any means necessary. 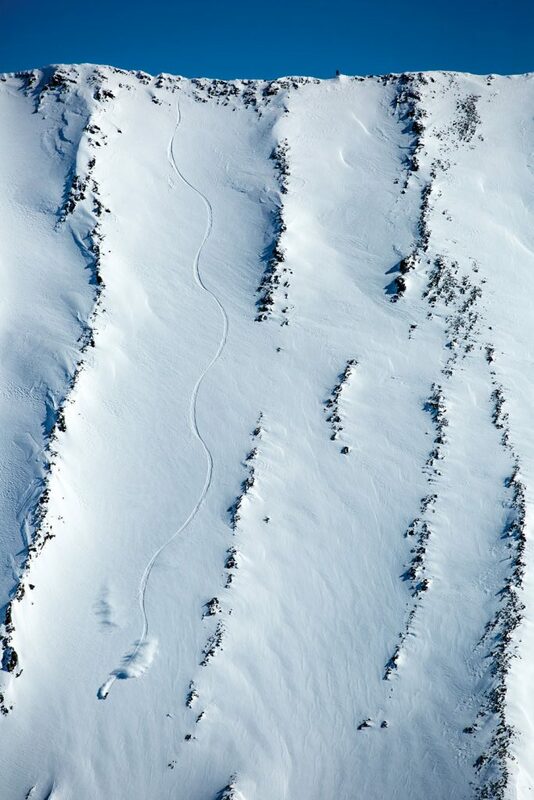 Tough access aside, the Crazies generally get less snowfall than the adjacent Absarokas or Bridgers and are prone to strong winds that can whisk away any accumulation. However, this past winter many parts of Montana saw upward of 200 percent of the average snowfall. The Crazies were caked. Yeah, we had to find a way. And much of the talk as we prepared to embark surrounded tales of the range’s namesake. One story holds that it’s a shortened version of “Crazy Woman Mountains” after a woman sought refuge from insanity there following the death of her family during westward settlement. A more likely and spiritual connection comes from the Native American Crow Nation who named them Awaxaawapìa Pìa, or “Ominous Mountains,” and believed they had metaphysical powers and remained unpredictable. The Crow people went up there on vision quests. With the help of a few local riders we worked our way in from a public access point to the west, a caravan of snowmobiles draped in gear and towing toboggans. We spent the day ferrying goods and setting up camp near Cave Lake. Armed with two trusty locals, a James Beard award-winning chef, a whole media production team and giant cache of supplies, we were ready for a long lurk. Then nine days of our own vision quests began—including a highlight-reel afternoon on Iddings Peak. On the second day the crew slithered through some skinny couloirs we had spied on the way in. Then we agreed to explore more after lunch. Our afternoon reconnaissance mission to a south ridge above camp turned into something more significant once the crew got eyes on Iddings. Steep, top-to-bottom fingers of snow masked the mountain and stared back at us from more than a mile away. A long, low-angle ramp and large lake sat between the riders and the peak, basking in the bright afternoon sun. Soon, a race against time began, but cirrus clouds hung high. By the time they had kicked in a couple of switchbacks, the sun was gone to an incoming storm and we were forced to retreat. That evening the weather shifted into a night of wind and snow. A constant barrage of flapping nylon and the slow constriction of snow squeezing our tents kept most of us in a dazed, half-dreaming state. The storm walloped the kitchen and many of our tents, and we spent most of the following day fighting off incoming snow. Then in the evening the skies broke, the bitter cold bit, and we prepared for a pristine day ahead. We woke early to clear skies and relative stability, considering the heavy winds and near three feet of snow. The crew put in a few laps on faces adjacent to camp to test stability before embarking on the long journey to Iddings. Although we left in the afternoon once again, this time the skies were in our favor. It took a few hours just to reach the foot of Iddings. Once there, Jeremy, Robin and Mark etched switchback after switchback up the looker’s right shoulder, cutting an impressive zigzag on the untouched mountain. By the time they reached the top, they’d been chasing the peak for more than five hours. That much walking had parched the riders and they filled their bottles with meltwater from exposed rocks. The media crew, me included, idled on an opposing ridge as faint echoes of sun-warmed fresh snow began to rumble around the valley, some of it spewing through a funnel on a westerly aspect well to the right of Jeremy’s proposed line. The north-facing lines they wanted to ride held cold and looked perfect. The peak’s wide, vertical serrations of rock created perfect paths for each rider. When it was time to drop, Jeremy, Robin and Mark all got a lane of steep and sustained blower pow—it was better than we could ever have imagined. The face, the conditions and the timing became the highlight of our stay. It was so good that with an already large day behind him, Jeremy decided to bag another lap while Robin and Mark made their way back and the sun melted into the horizon. Together again at camp, we ate as our muscles ached from a full day of touring these beautiful basins. 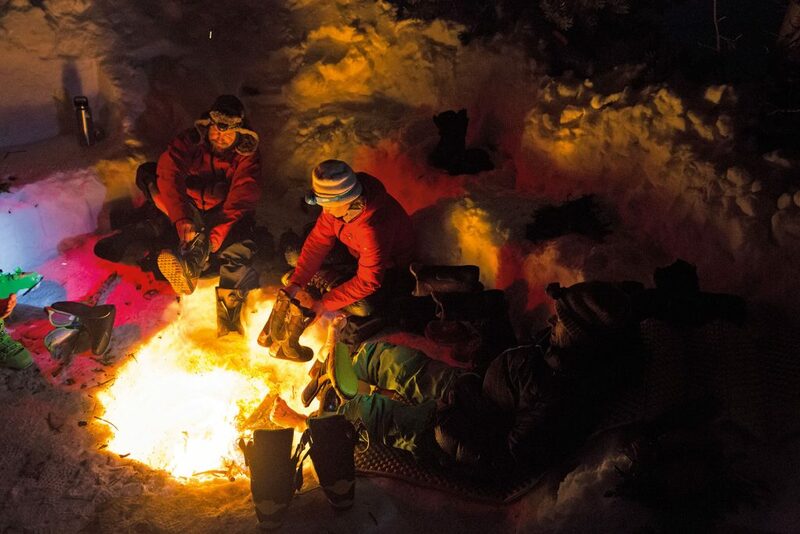 Later, we basked around a fire with bellies full, whiskey downed, clothes sweat sodden and minds logged with new imagery. We roasted socks, insoles, liners and gloves over the fire. Tomorrow, we’d chase new visions up high. This article was originally published in Volume 16, Issue 2 of The Snowboarder’s Journal.